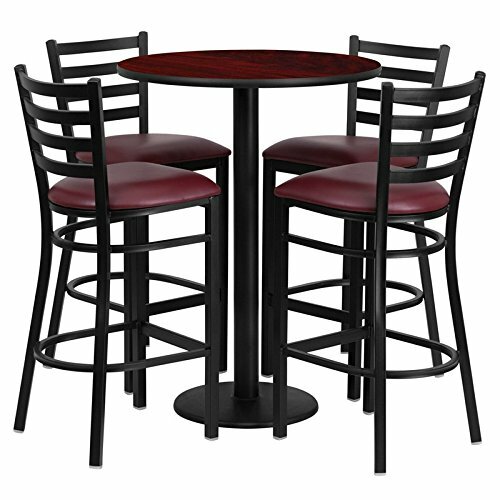 No need to buy in pieces, this complete Bar Height Table and Stool set will save you time! This set includes an elegant Mahogany Laminate Table Top, Round Base and 4 Metal Ladder Back Barstools. Use this setup in Bars, Banquet Halls, Restaurants, Break Room/Cafeteria Settings or any other social gathering. Mix in Bar Height Tables with standard height tables for a more varied seating selection. This Commercial Grade Table Set will last for years to come with its heavy duty construction. If you have any questions about this product by iHome Studio, contact us by completing and submitting the form below. If you are looking for a specif part number, please include it with your message.